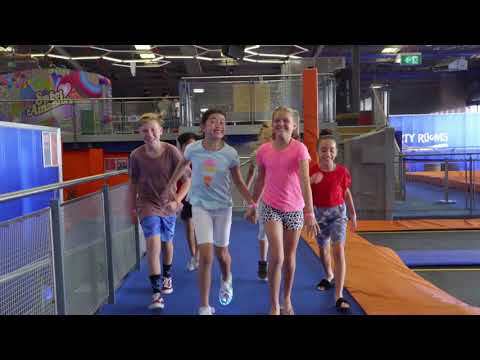 With more than 100 interconnected trampolines that let you literally bounce off the walls, and a range of indoor trampoline activities, we've got the fun covered for both kids and adults. Newbie? Practice getting massive air at The Stratosphere then show us your ultimate dunk at Sky Slam. Got some skills? Do a sweet flip into The Pit or challenge your mates to a game of Dodgeball. Thrillseeker? No worries! Show off your sick combos on The Wall and earn your title as Lord of the Springs. Even the kids can join the fun with our toddler only areas. We've got something for everyone, so what are you waiting for? WHAT DOES A JUMPing SESSION INCLUDE? Our Jumping sessions are run every hour, on the hour. They give you access to all of our jumping zones including the Pit, Dodgeball, Sky Slam, the Wall and Stratosphere. PLUS our Enduro Warrior Course currently at Alexandria and Miranda and coming soon to Macgregor. Find out more about each area below! The Stratosphere is where you learn to fly. Jump from trampoline to trampoline with your mates, get a feel for anti-gravity and teach yourself to soar. A good place to learn the basic skills of Sky Zone. Everyone’s tried to sink a slamdunk at least once, but basketball hoops are high and legs are short and gravity makes life difficult sometimes. Hit up Sky Slam and make it happen. Nothing but net, baby. Get enough practice in and pretty soon it’ll be on like LeBron. Challengers, are you ready? 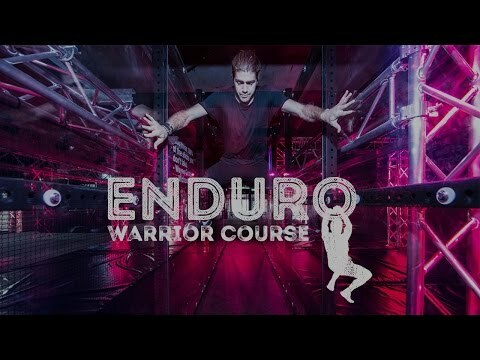 Put your strength to the test or just learn the ropes as you take on our next level Enduro Warrior Course. We’re all about big air and soft landings. The Pit is your go-to flip and fall destination. Get a run up, take your leap of faith, and land safely in a pool of huge foam squares. That’s the easy part. Good luck getting out. Four dodgeball courts, four playing fields for intense ducking and dodging competition. One of Sky Zone’s most popular areas, the four zones are waiting for you to unleash your inner-athlete. You can bounce, duck and weave your way to glory. Go get ‘em, tiger. The Wall is for the serious jumper. The athlete, the daredevil, the parkour enthusiast, the thrill-seeker. Walk it, run it, sit on it and admire the view! You can talk the talk but can you walk The Wall? It’s not for the faint-hearted. The Stratosphere is where you learn to fly. A general jumping area with over 117 interconnected trampolines, you’ll literally be bouncing off the walls! Jump from trampoline to trampoline with your mates and make some new friends along the way, get a feel for anti-gravity and teach yourself to soar. It's the freedom of flight - no skills necessary, no age too old, no height too tall, just bounce away, strike a mid-air pose and let your inner-child out. A good place to learn the basic skills of Sky Zone before going hard in the other zones. Everyone’s tried to sink a slam dunk at least once, but basketball hoops are high and legs are short and gravity makes life difficult sometimes. Hit up Sky Slam and make it happen. Bounce down the trampoline court and slam dunk those basketballs. Think you’ve got the bouncing-baller’s skills down-pat? Try and make those slam dunks in a higher hoop. Get tricky and score some three-pointers. Nothing but net, baby. Get enough practice in and pretty soon it’ll be on like LeBron. Challengers, are you ready? We’ve got our ropes up and our Enduro Ninja Warrior Course is in full swing. Be stealthy, be swift and weave your way around like the warrior you are. Climb over bars, through floating boards and fling your way across hanging rings into the bamboo forest. Whether you’re learning the ropes or king of the swing, our sky high warrior course will put anyone up to a challenge. Gather your mates and get into the swing of things – it’s the ultimate endurance test. We’re all about big air and soft landings. The Pit is your go-to flip and fall destination. Get a run up, take your leap of faith from the trampoline, and land safely in a pool of huge foam squares. That’s the easy part. Good luck getting out. Our Alexandria guests have a whole new way to get big air with soft landings. Introducing the Big Bag. A giant inflatable bubble of fun hanging out in a sea of foam. Throw down your flips and tricks and fall freely onto our comfortable crashpad. Bombs away. It may have taken a Ben Stiller and Vince Vaughn film to make it happen, but in a flurry of spandex and sweat, dodgeball is making a comeback. While we’re not really sure how the appeal of throwing stuff at your mates ever went out of fashion, we’re riding this lycra-clad fad with dodgeballs blazing. Four trampoline dodgeball courts, four playing fields for intense ducking and dodging competition. One of Sky Zone’s most popular areas, the four zones are waiting for you to unleash your inner-athlete. With four private dodgeball courts, you can bounce, duck and weave your way to glory. Go get ‘em, tiger. The Wall is for the serious jumper. The athlete, the daredevil, the parkour enthusiast, the thrill-seeker. Walk it, run it, sit on it and admire the view! Bouncing off the walls? It’s not for the faint-hearted. Do flips and tricks and show off all your acrobatic skills in this performance area specifically zoned off for the advanced bouncer. Feeling confident? Choose from three different base-levels to jump off and show everybody what you’ve got.